This would be my second visit to Albania, the first having been eight years earlier, when I went to the north of the country for a few days. An account of that trip can be found elsewhere on this site, and ideally should be read before reading this one. 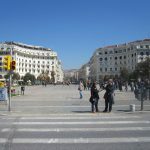 The plan now was to fly to Tirana, hire a car and drive to Thessaloniki in Greece via southern Macedonia, then across northern Greece to the Adriatic and up the west coast of Albania back to Tirana, basically a circular tour. The only flights to Albania were, as before, by BA from Gatwick, but as I stood in the queue for the plane I realized that the make up of the passengers was quite different. Instead of being predominantly male there were now a fair number of women and children. On arrival in Tirana there was still the mystery over the division into ALBANIAN CITIZENS and OTHER NATIONALITIES, most of the latter not being British, so what were they? Because of the late evening arrival I had booked a room at the Jurgen Hotel directly opposite to the terminal, thereby avoiding the taxi touts. This was a smart hotel for £35, although I had to go to the Best Western next door for a meal. Breakfast at the Jurgen was slightly odd, consisting among other things of scrambled egg and prunes, but it was quite adequate. 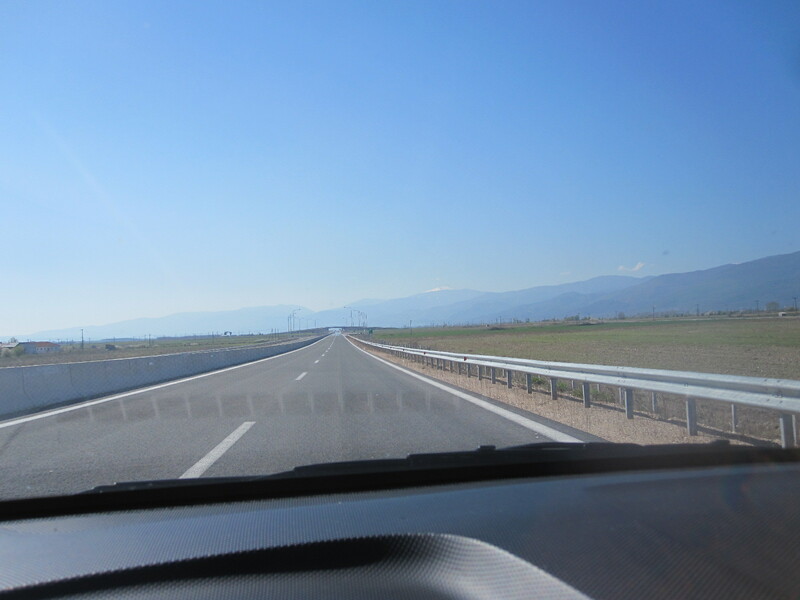 Several of the well-known rental car companies operate in Albania, but at the planning stage I had to dig deeply to find one that would enable me to take the car into Macedonia and Greece. Bearing in mind that Albania used to be regarded as second only to India for bad driving one would have thought that most firms would have been pleased for someone to take the car out of the country, but the only one that provided that facility was Sixt, who had a desk at the airport. The man from Sixt turned up at the desk more or less at on time and took me to their depot round the corner, where I was introduced to my Hyundai Accent Diesel. Considering that it was Albania there was remarkably little body damage to note down, and I was soon on the way to Tirana. Within a short time I noticed two differences from my trip eight years earlier, namely that the traffic was much calmer and that there was far less rubbish around everywhere. It seemed that there were now properly organized refuse collections, with bins at the roadside in many places. The predominance of old Mercedes cars was less striking, with more people driving typical modern small cars as elsewhere in Europe. 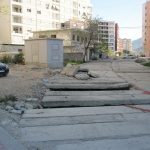 My route took me right through the middle of Tirana, past Mr.Hoxha’s famous pyramid, which contrary to my expectation did not appear to have been renovated and was in much the same dilapidated condition as when I last saw it. 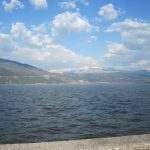 My initial target was a town called Elbasan some distance the other side of Tirana, and I was struggling fairly successfully through the awful city centre traffic until I came to a massive roadworks with no direction signs of any sort. 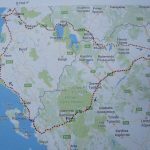 With the help of the map in my tablet I eventually got on the road to Elbasan after driving through barriers on a stretch of closed road which was a building site, and it was very slow going for about 30 miles with endless roadworks and diversions. 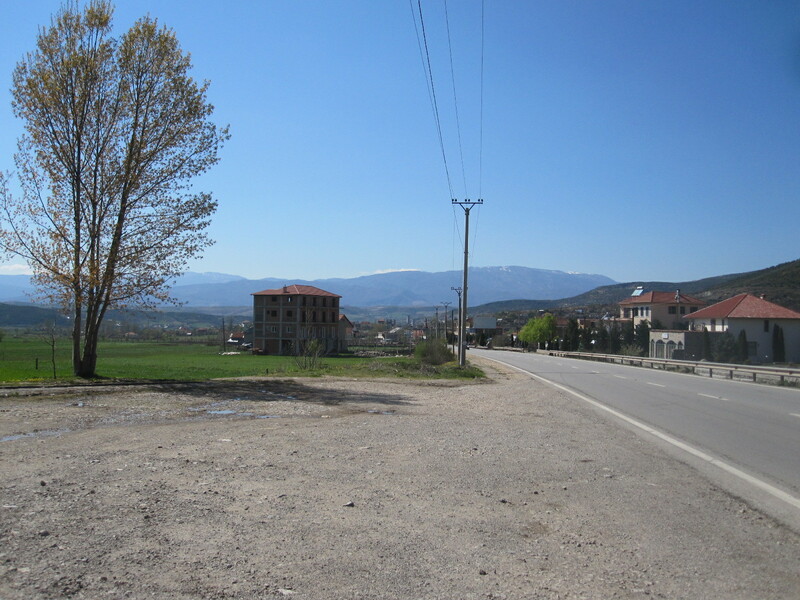 This area has typical Albanian semi-urban landscape, with an inexplicably large number of filling stations and part-finished buildings. 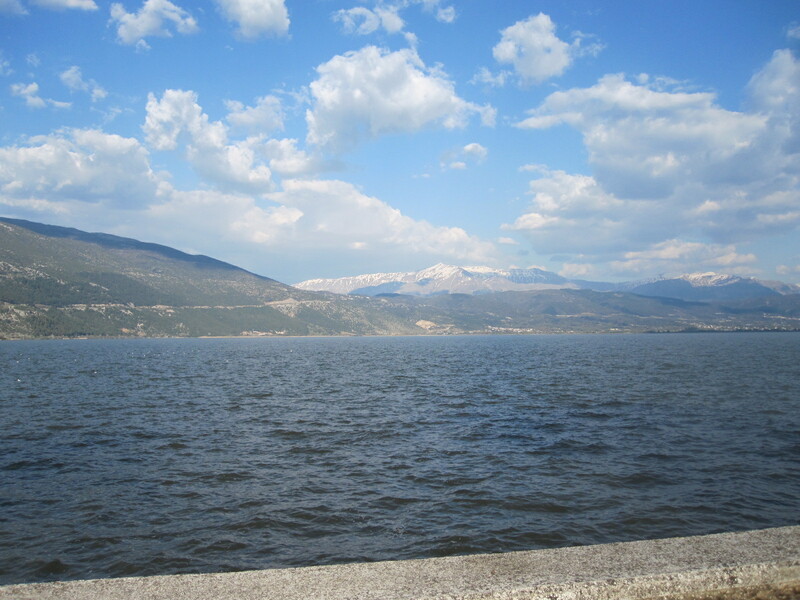 The 40 miles from Elbasan to the Macedonian border was much more pleasant driving with less traffic and good scenery. I had no idea what to expect at the border, but was pleased to find only very few vehicles going my way. The people at Sixt told me that I must buy a car insurance green card for Macedonia and Greece from a kiosk at the customs post, and that proved to be extremely easy for a fee of 40 euros. Neither Albania nor Macedonia use the euro but they seem to expect foreigners to do so. My passport and the car papers were checked at the customs on both sides of the border, with a few questions on the Albanian side, but I was through quite quickly. Such was my poor planning for this trip that it was not until I was in the country that I discovered that the Macedonian language uses the Cyrillic character set, like Russia and Bulgaria. The language is closely related to Bulgarian and entirely different from Albanian and Greek, the other two countries on my itinerary. The Cyrillic languages are actually quite easy to cope with if you do a bit of brushing up in advance (which I hadn’t this time), whereas Albanian is impossible and Greek, well, it’s all Greek to me. There are complications concerning the name of the country, because the Republic of Macedonia, as it calls itself, covers about one third of the geographical region known as Macedonia which extends into neighboring countries including a large part of northern Greece. As a result the Republic of Macedonia is known by the UN, EU, and NATO as FYROM (Former Yugoslavian Republic Of Macedonia), and that name appears on some road signs. 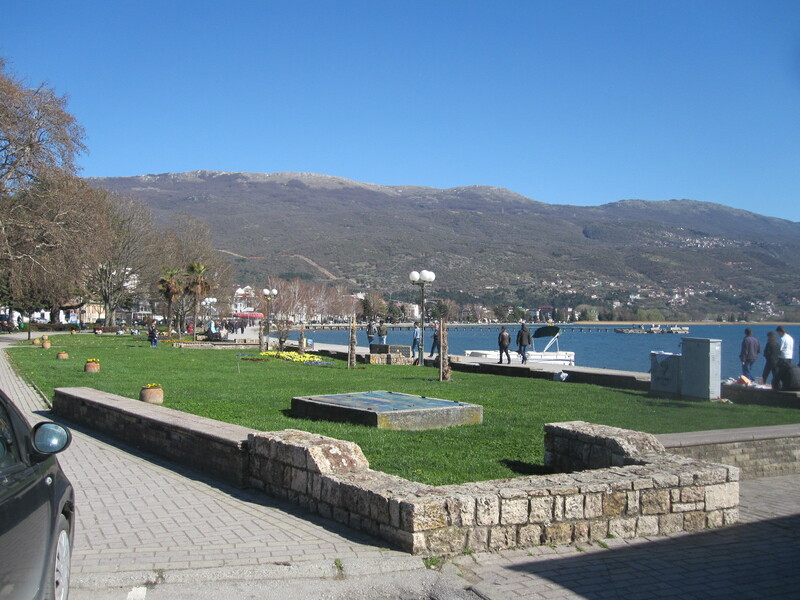 From the border the road follows round the shore of Lake Ohrid, passing through a small town called Struga, with its pleasant lakeside promenade. 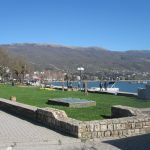 The next town, Ohrid, was described in my guide book as a jewel in the crown of Macedonia and had a spa-like atmosphere in its lakefront region. 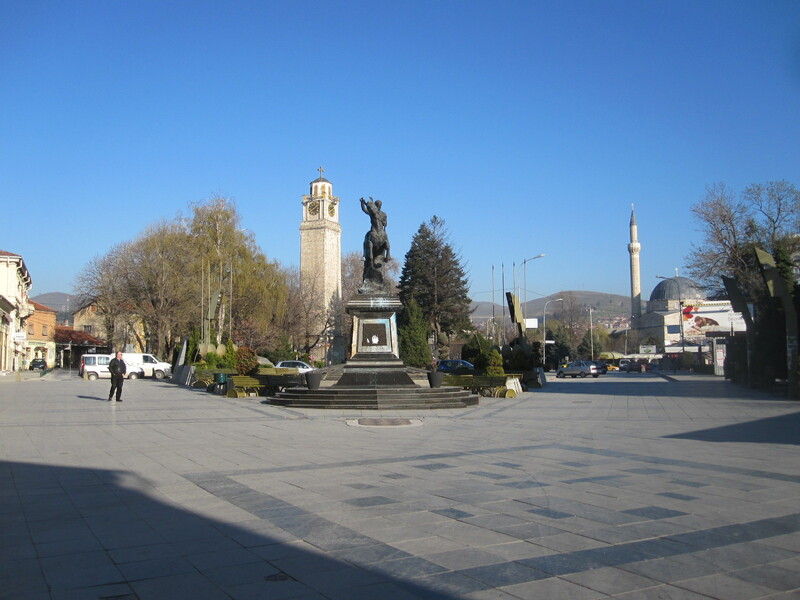 My night stop was to be in Bitola, the second city of Macedonia (the capital is Skopje), about 40 miles from Ohrid. 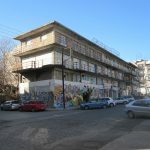 By now I had the impression that the pace of life in Macedonia was considerably slower than in Albania, with an economy based more upon agriculture. Once clear of Ohrid I seemed to be making good progress on a smooth road through heavily wooded countryside, until encountering a diversion where the road in the direction I was going was being rebuilt. As well as slowing me down this took me back in time to something I had not seen since Belgium in the 1960s, namely the type of road surface called pavé, small rough stone blocks which would set the car vibrating from end to end and shake the fillings out of your teeth. This went on for several miles in the form of a narrow hilly lane with one-way traffic through a forest before rejoining the original route. Perhaps the best description of Bitola is simply ‘old-fashioned’. 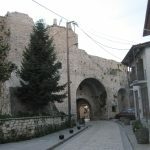 It is a very old city, dating from about 4BC and has a chequered history but most of the buildings today are from the Ottoman era or later. At one time it was known as the ‘City of Consuls’ because many countries, including Britain, had consulates there, but it now seems to be of less political significance. were few and far between. The hotel did not do food, and the man recommended a restaurant in the main street which was only about 100 yards away. I had no Macedonian currency, but fortunately the restaurant took Euros. 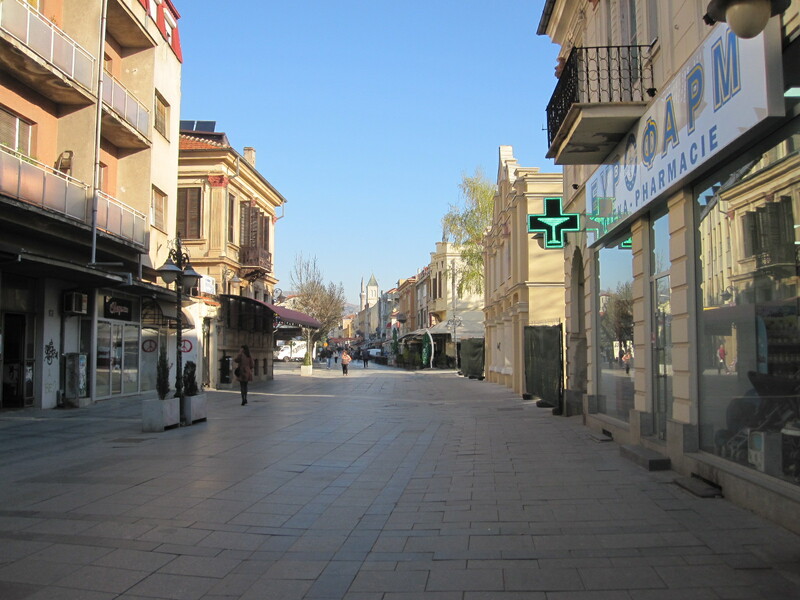 Looking round the town afterwards I got the impression that it was not one of the most prosperous places in Europe. At breakfast time I wandered back to the main street which was still largely asleep and eventually found a hotel that served non-residents. 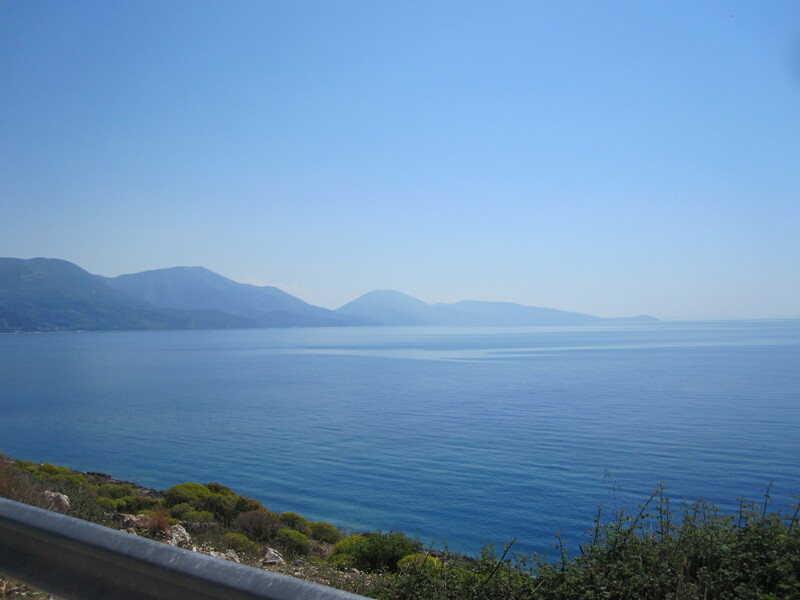 The drive to the border crossing into Greece was quick and easy, again with just a few vehicles in front at the customs posts and brief document checks. At Niki, shortly after the frontier post the road turned into a superb newly-built motorway for about 12 miles, with not another vehicle going in my direction and few the other way. If more British people could see their money being spent in this way by the visionaries and dreamers of the EU they would have no reservations about our decision to leave. It will be very many years before there is sufficient traffic travelling from Greece through Macedonia and beyond to justify this expense, especially considering the economic state of Greece. 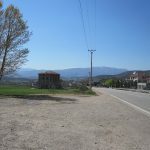 On the map the main road to Thessaloniki from near Florina via Edessa and Giannitsa looks interesting, with potential for good scenery, but in the event it was a disappointing drive. As mentioned above, the Greeks refer to this area as Macedonia (or Makedonia) and many place names are given in Cyrillic and Greek characters but not Latin (English) ones. 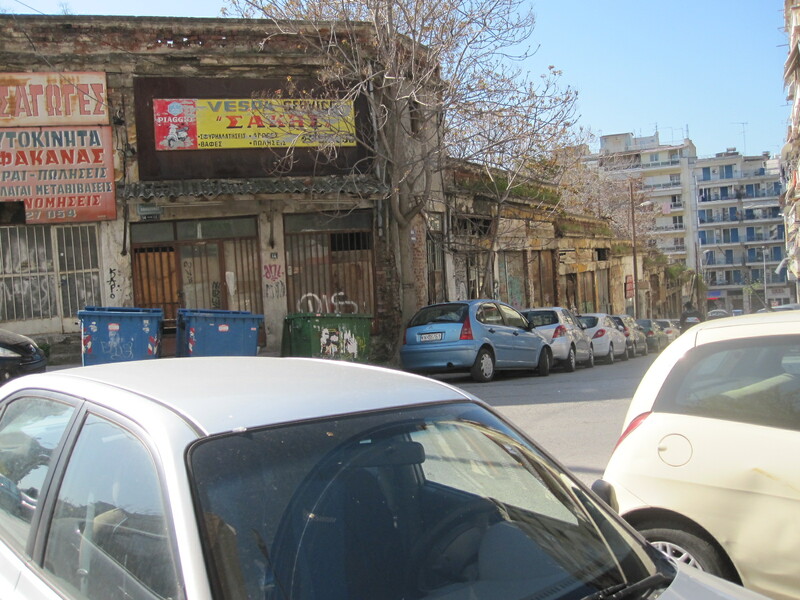 On the approach to Giannitsa I saw the first signs of the Greek economic disaster. For some distance there were factories either closed or showing little sign of activity, with just a few cars outside and maybe one truck. 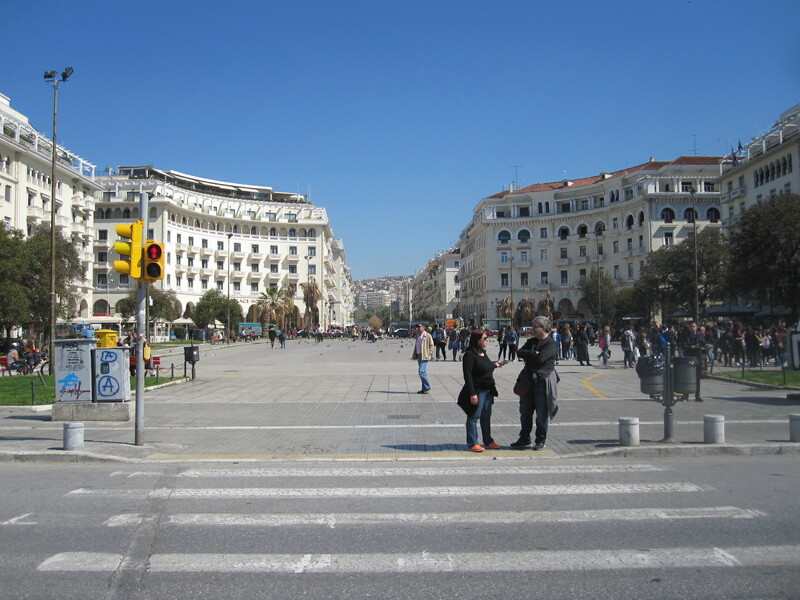 Approaching Thessaloniki, Greece’s second largest city it was the same story. My hotel, the Rotunda, was near the centre, facing the main railway terminus and at the start of a massive construction project to build a metro. 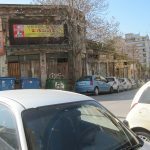 After checking in I walked around the streets behind the hotel and the consequences of the recession were all too clear, with boarded up shops and dilapidated empty buildings. Just to bring home the misery I was chased by an angry dog and bitten in the back of the leg. Fortunately my jeans prevented any serious injury. time as a student at Brunel University. 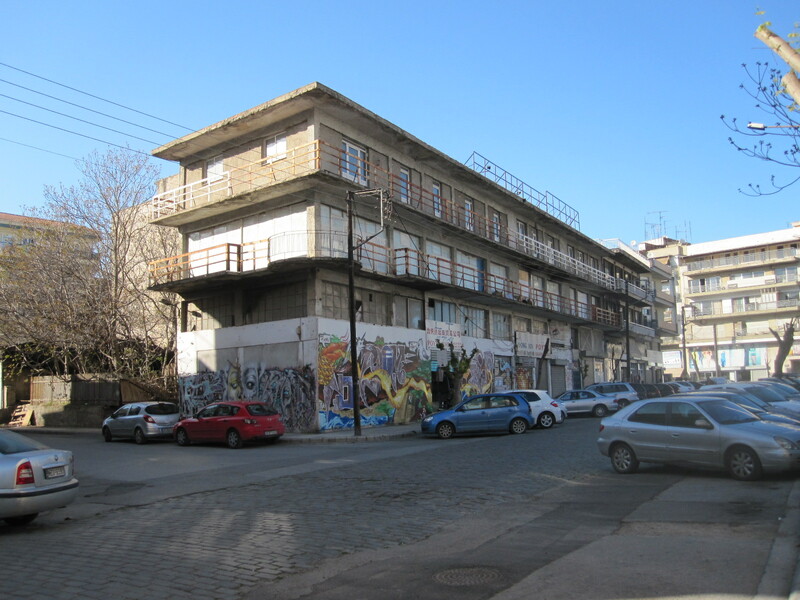 Brunel is a technical university and it seemed odd that he chose to return to the poor employment prospects in Thessaloniki unless, of course, he was the car park operator, in which case he was probably making more money than he could make as an engineer anywhere. 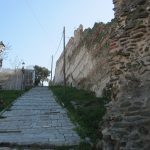 Following his advice I quickly found the old town area with its ruins, which just went on and on as I climbed up the hill towards the back of the city. 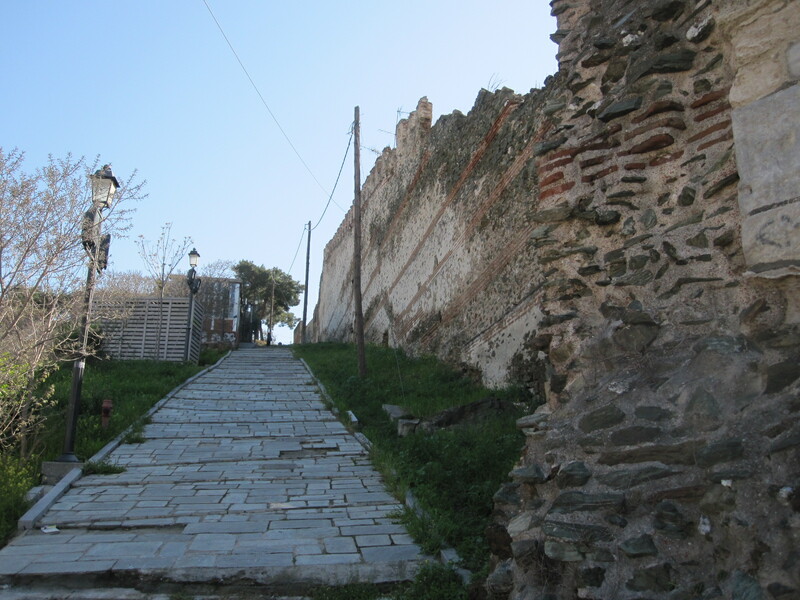 The route took me up a long fairly steep path alongside the ancient walls, and I had another encounter with an angry dog whose owner apparently lived in a sort of hole in the wall. He made no attempt to control the dog as it ran round me growling and snarling. If the intention was to deter strangers from going close to his property it was successful, and I sought a different way back. I did not manage to get to the top of the hill, but was high enough to see across the whole city to the harbour and sea beyond. Straight down the hill brought me back to the ferry terminal and smart promenade which is bisected by a beautiful paved square with classical buildings. At the far end of the promenade is the White Tower, a famous monument and museum which I unfortunately did not have time to visit. 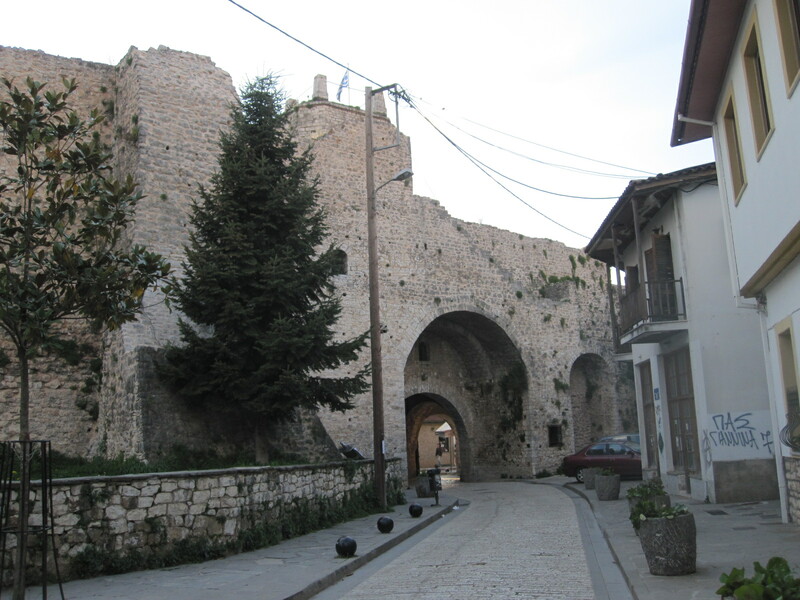 Back to the car and on the way to my night stop, a town called Ioannina, about 160 miles south east of Thessaloniki via a motorway passing through beautiful mountainous countryside. The extraordinary thing about this road was the number of tunnels. I lost count en route, but checked on the map afterwards, and there were 38, ranging in length from 50 yards to about 2 miles. It was a toll road with 4 or 5 payment stages along the way, the charges actually being remarkably low, a fraction of those in France. 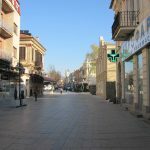 Ioanninia is a town of 80,000 inhabitants with a fair amount of industry and an area of historic buildings alongside a large lake. It had the atmosphere of a Swiss lake resort, even down to a Hotel du Lac which was well outside my price range. There were a fair number of hotels, none of which seemed to have any vacancies, rather to my surprise considering that it was a Thursday evening in April. Eventually I found a room in a small old-fashioned hotel more or less fronting on to the lake, and set off for a look round the town, starting with the old part. The first thing I noticed was that all the eating and drinking places were crowded with young people, and later discovered that the town is home to 20,000 students. It gave the impression of being a thriving place, very different from Thessaloniki, with shops open until late in the evening, including many with windows full of expensive watches like those to be found in Interlaken. Then came the big mistake. As I had eaten well earlier in the day I decided to have just a large ice cream in a restaurant specialising in such things, and before I got back to the hotel I realised that it was lying heavily upon my stomach. That was not to be for too long, because before going to bed it came up in five stages, with two more the following morning. I cannot remember what happened at breakfast time, but I don’t think it was very much. In fact, not much happened with regard to eating for the next three days. 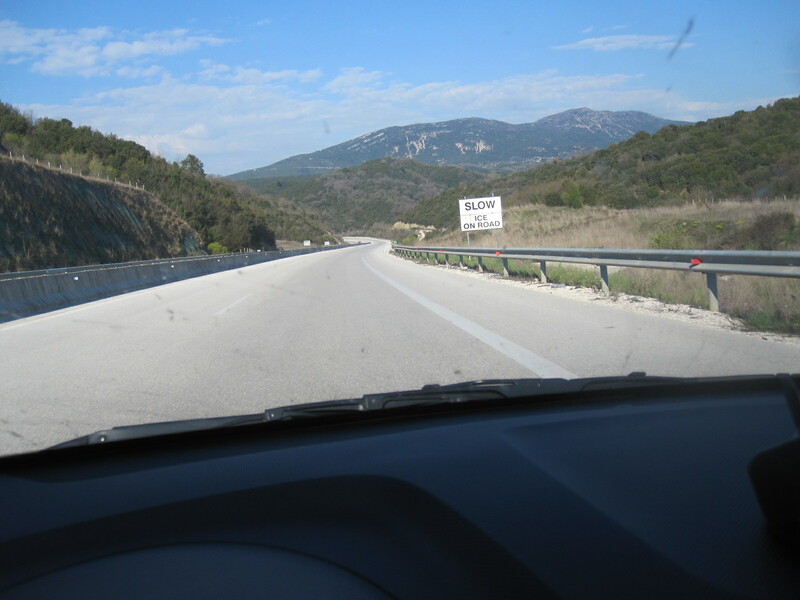 Igoumenitsa and driving up to the border crossing at Konispol from there. 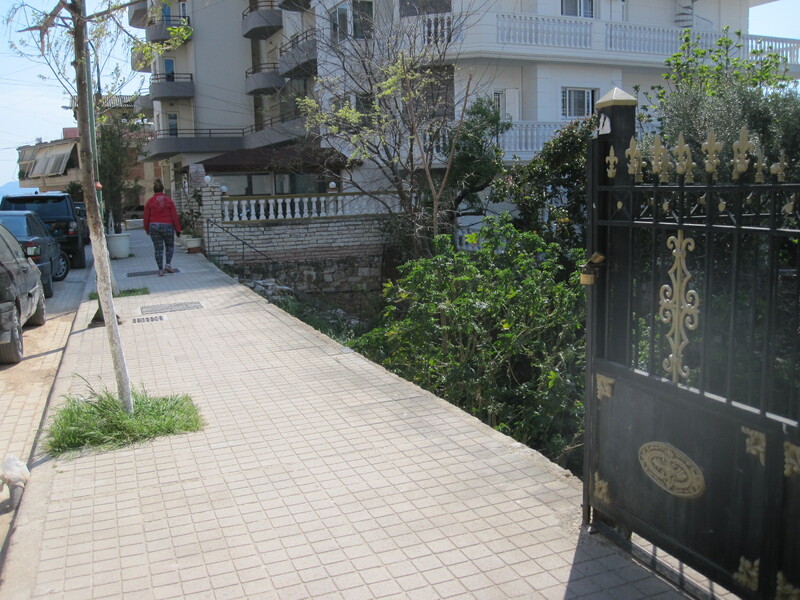 The road network on the Greek side in this area is vague to say the least, and signposting almost completely absent. Albania did not seem to exist and the customs post was remotely situated on top of a mountain like something out of a film set. The man on the Albanian side studied my passport for about five minutes while I sat there with the engine running, presumably because he had nothing else to do. 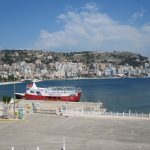 Saranda is a well-developed resort built around a bay, and undoubtedly gets a considerable boost to its tourist trade through day-trippers on the ferry from Corfu. 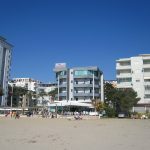 My maps showed a concentration of hotels at the northern end of the coastal strip, and I found a balcony room overlooking the beach in one called the Apollon. It gave the impression of being recently built, and when I asked the young lady in reception how old it was she said it was started in 1999 and finished in 2007. 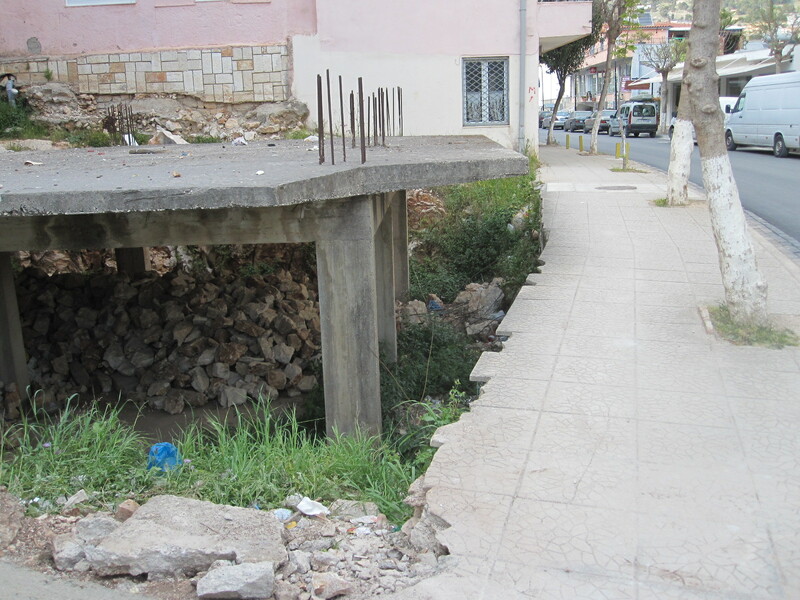 This rate of construction seems to be par for the course in Albania, and judging by the number of part-finished buildings everywhere I think many take much longer than that to complete. 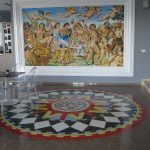 Striking features of the hotel were a large mural in with a circular mosaic several yards in diameter in front of it in the entrance hall. 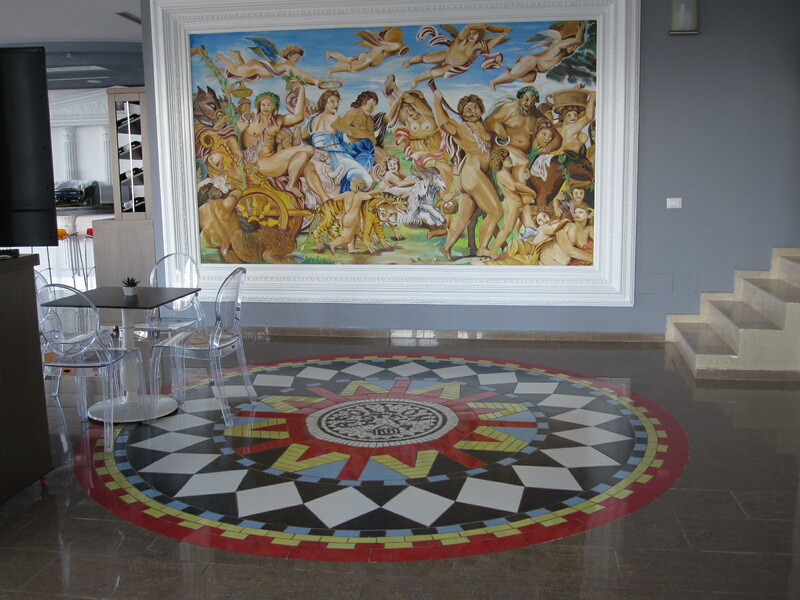 The mural depicted a scene of debauchery and was presumably a copy of an established work of art, and the mosaic reminded me of the black magic circle in Dennis Wheatley’s “The Devil Rides Out”. At least the guests will have somewhere to stand if the Angel of Death turns up on his horse. from the road. At one point a thin concrete ledge stuck out over the pavement at eye level, and wherever you are you have to pay attention to your immediate surroundings. Not ideal for those who walk along staring at their mobile phones. 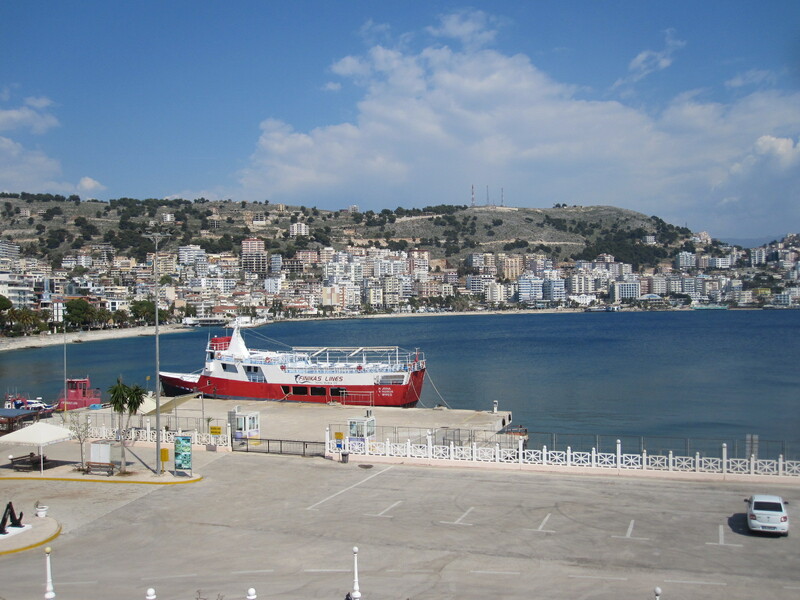 Apart from this Saranda is a pleasant resort town, with a promenade around the centre of a horseshoe-shaped bay. 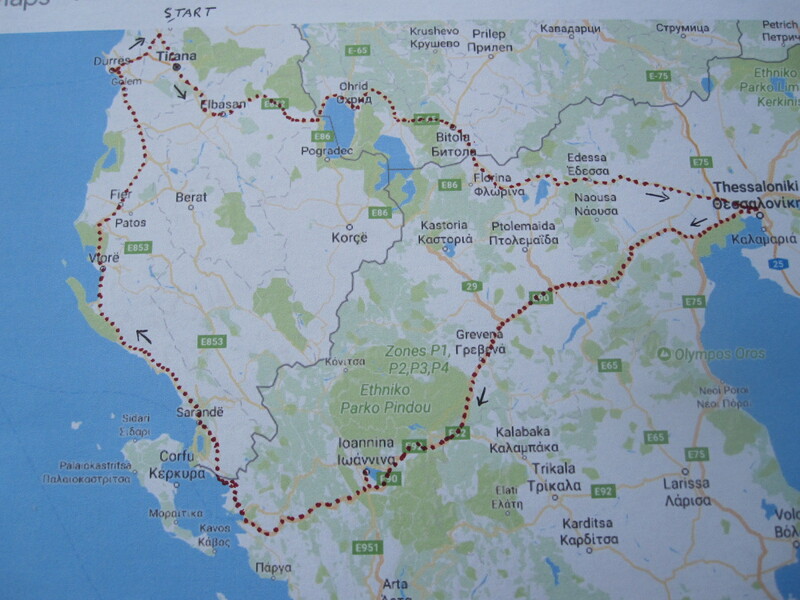 The plan for the next day was to drive 77 miles north to Vlora, the next main town on the coast. From the map I was expecting it to be a spectacular drive, and it was, by any standards. For much of the time the road ran close to the shore with endless bends and a zig-zag climb to over 3000ft, leading to a viewpoint. 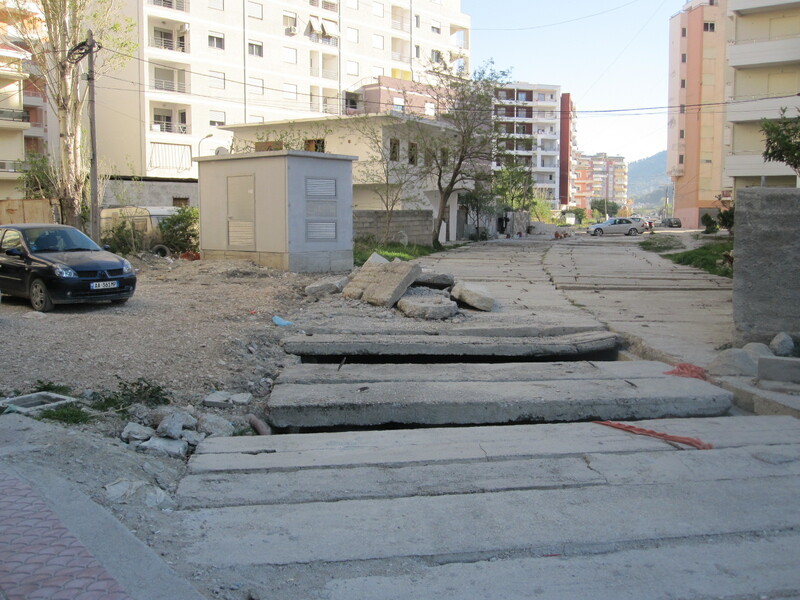 The main road was well-surfaced, but a couple of times I turned on to side roads that appeared to lead to places of interest and as usual in Albania they just turned into rough tracks or fizzled out altogether. The traffic was light and on one occasion I came round a bend in a village to a find the roadblocked by a lorry with crane unloading building materials. There was no alternative route, so I and the few vehicles that came up behind me just had to wait about 20 minutes until the job was done. 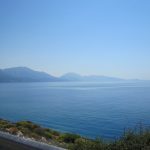 For about 12 miles before Vlora the road ran through a number of attractive little beach resorts with hotels and restaurants before turning into a dual carriageway under construction, leading to the town centre. 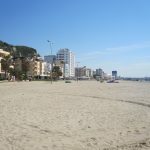 It was very much a case of work in progress and will undoubtedly be an impressive promenade once it is finished, but it was a mess and impossible to stop and look for a hotel until I reached the end of it. The only hotel that was easily accessible was Hotel Partner, a large modern building in the town centre, so that is where I finished up. feature was the number of large diesel generators everywhere. 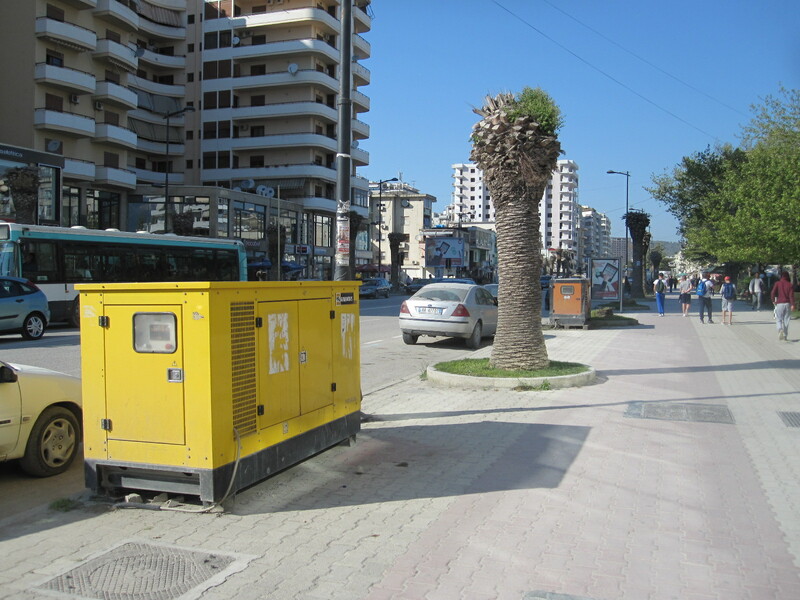 I did not remember seeing any in Saranda, although Albania is notorious for its inadequate power supplies and it seems that the situation had not improved in some areas in the 8 years since my last visit. There was not more mains electricity, just more generators, which are very inefficient and bad for the environment. 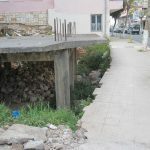 the town were in a bad state, some completely impassable due to obstructions of one sort or another. 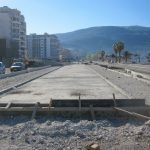 Vlora is actually on the side of a large bay, with the beach front facing the heavily wooded hills of a nature park on a promentary, and one day, if and when the construction work is finished, it will be an attractive seaside resort. 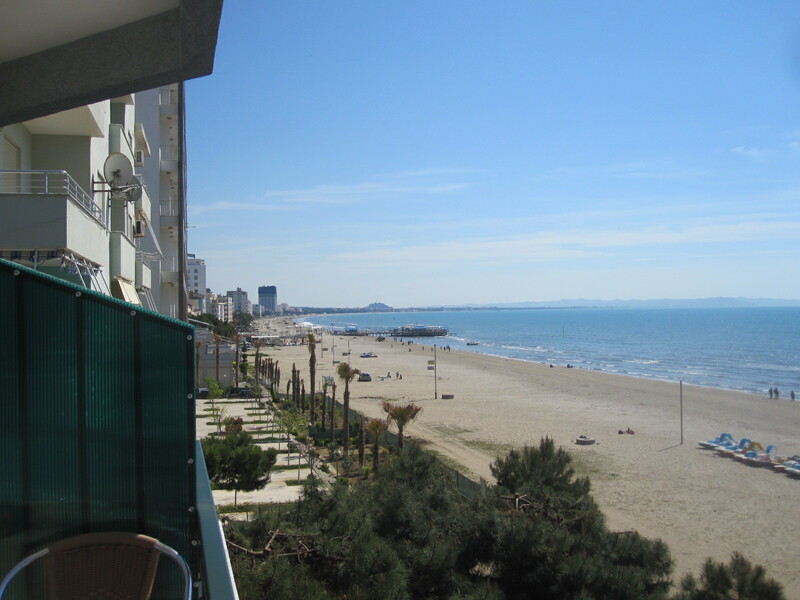 During the 75-mile journey from Vlora to the next coastal town, Durrës, the whole character of the surroundings changed. The road was largely dual carriageway situated some distance from the coast, with roughly-surfaced stretches running through run down areas.. The standard of driving deteriorated, with cars swerving all over the road to avoid the pothole as in India, and the scenery became more industrial. 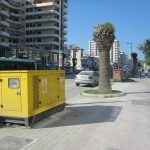 Durrës is the seaside town for Tirana, the capital, and it was a return to the concentration of half-finished buildings and filling stations that dominated the start of my journey. 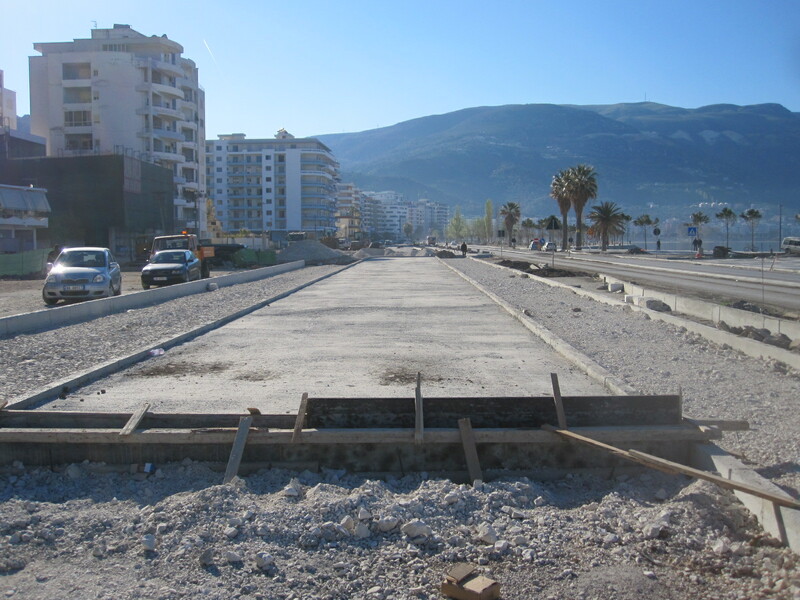 The main road into Durrës was in much the same state as the one into Vlora – just a massive construction site. It was Sunday afternoon and the place was heaving with people, including a couple of wedding parties driving through the town with much horn-blowing and general commotion as is customary in those parts. At the far end of the road I parked and went through to the beach, which was a wide stretch of heavy sand, quite clean but almost deserted. There were a lot of hotels on the side of the road backing on to the beach but with the roadworks it was hard to get to any of them or park and after trying three or four which were full I decided to go back to the coastal strip at Shkallnur that I had passed on the way in. acquired a room with a balcony overlooking the beach. The hotel did meals but I was still a bit under the weather from the ice cream poisoning and all I could manage was soup. 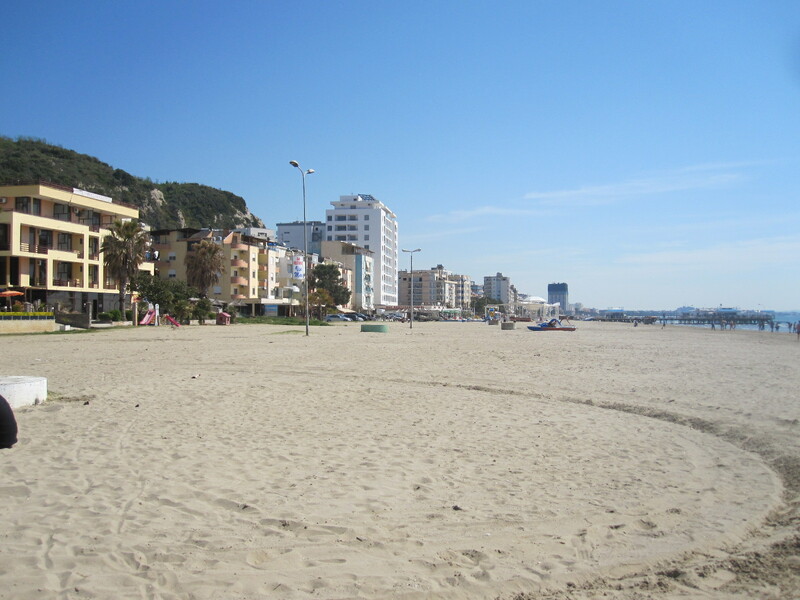 It was time for a long walk on the beach, which like the one in Durrës, was quite pleasant and almost deserted. When I came down for breakfast in the morning I was somewhat surprised to find that there appeared to be no one else in the building. It was the hotel equivalent of the Marie Celeste – everything in place but just no people. Eventually I found a very young lady in staff uniform who spoke no English whatsoever. It was clear that breakfast was not likely to be forthcoming, so as I had already paid for the room I walked past the unmanned reception and departed. 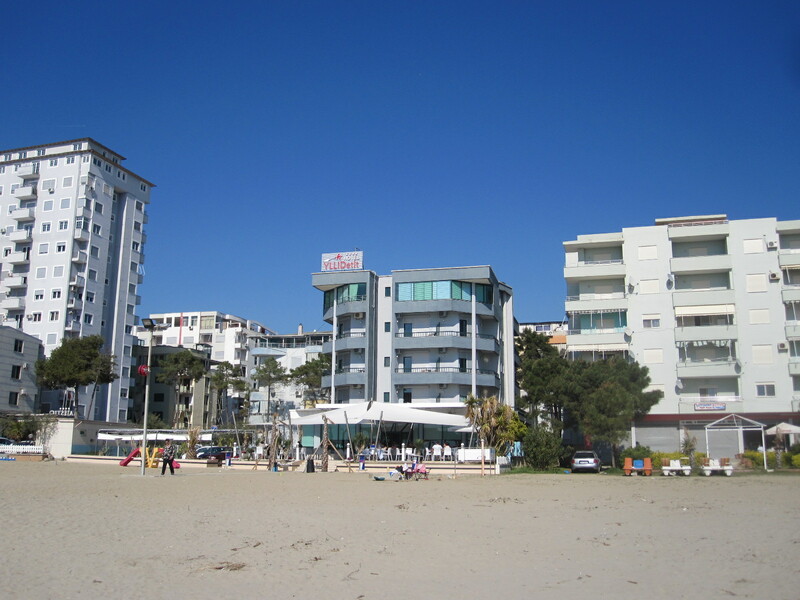 A short distance along the main road to Durrës was a petrol station with an excellent café, after which I went through into Durrës centre, which was much larger than I expected and unlike a lot of places had properly surfaced streets. 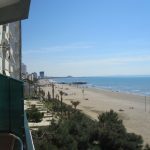 Some accounts describe Durrës as a dismal place, but it seemed to me to be bustling with activity, much more than I would have expected for a Monday morning. The afternoon was spent taking the car back (undamaged, amazingly) and dealing with the flight home. Albania is a conundrum. It is supposed to be a poor country and yet everywhere you go there seems to be a lot of activity, with quite large public projects underway, especially in the cities. 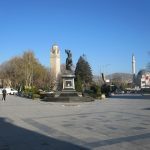 There is said to be corruption at high level and a general belief outside the country that there are many people engaged in criminal activity such as people-trafficking and money laundering, but Albanians will tell you that the bad people have left the country and are carrying on their evil deeds elsewhere. This may well be true.